*We listen more. We listen more than we talk. We believe you know best what type of farewell fits the unique life of your loved one. 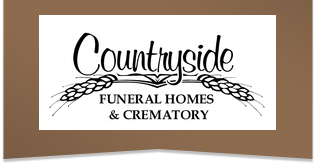 * For all of our quarter century of service, we have described our philosophy as 'common sense' funeral service. This entails many things: we do not hide our prices, we believe in offering less expensive options, we support our local community by hiring local and buying local, we support countless organizations and charities. * When it comes to honoring our Veterans, no other Funeral Provider comes close to our level of dedication and commitment. We take care of completing and filling out all of the necessary paperwork to insure that the family of a Veteran receives any benefits available. We insure that every Veteran receives an American flag and full military honors including ?Taps? and formal presentation of our flag. We arrange for every family to receive the Presidential Memorial Certificate and every Veteran receives a hardwood flag case to properly display the flag. The flag case is free of charge for every Veteran served by the Countryside Funeral Home & Crematory. God Bless our Veterans!